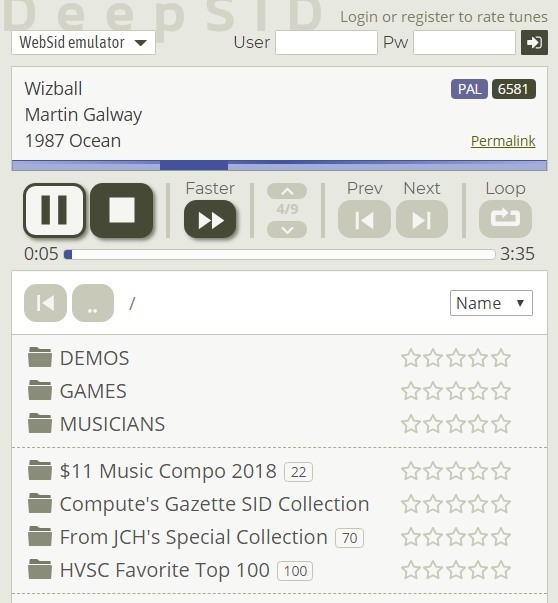 Indie Retro News: DeepSID - Browser SID emulator with thousands of playable tunes! DeepSID - Browser SID emulator with thousands of playable tunes! A short news article for this evening even though it's a damn good one. As we've come across a tweet on Twitter from Jaz Rignall regarding a browser SID emulator that has been developed by Jens-Christian Huus and released freely available on the internet as 'DeepSID'. This rather nice ear blasting extravaganza is easily usable online in your browser and features 1000's of Sid tunes that can be selected and automatically played through Chrome, Firefox or even Internet Explorer. The only downside so far that I can see is, there doesn't seem to be a way of uploading and listening to your own SID tunes.